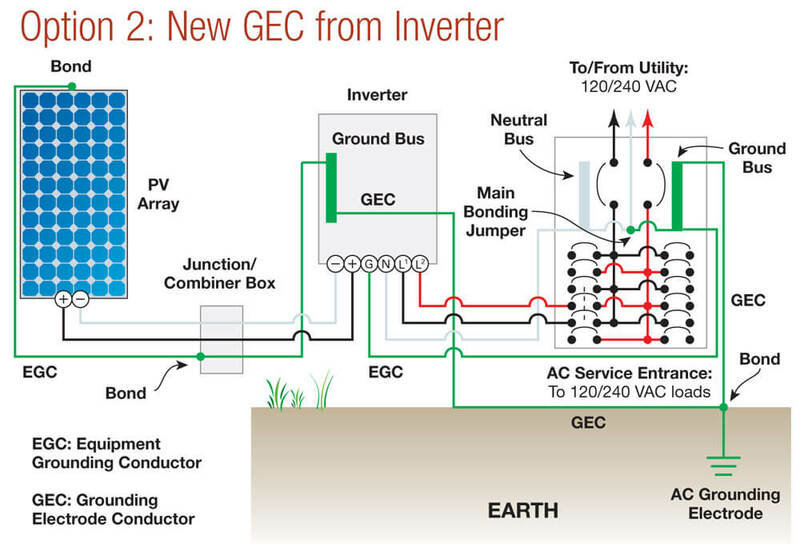 Some installations have reported damage to inverters, charge controllers, DC refrigerators, fluorescent light ballasts, TVs, pumps, and (rarely) photovoltaic panels. These damages cost many thousands of $, and ALL reports were from owner-installed systems that were NOT GROUNDED. It drains off accumulated charges so that lightning is NOT HIGHLY ATTRACTED to your system. 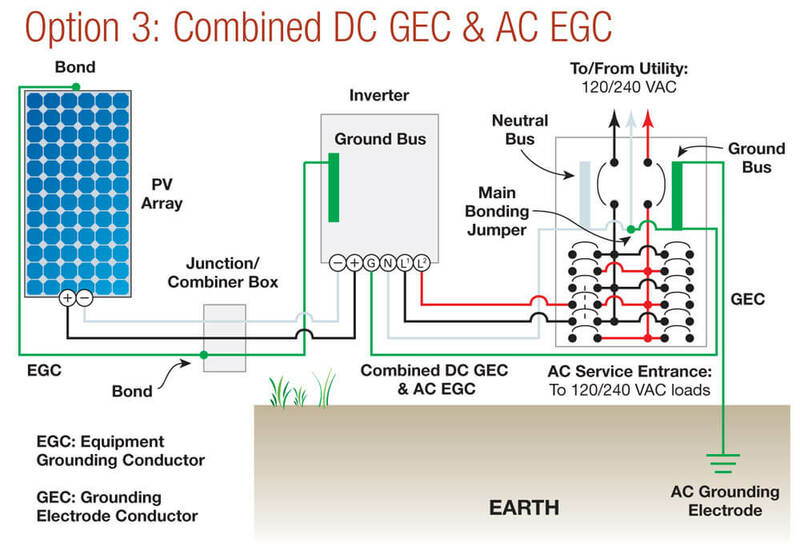 If lightning does strike, or if a high charge does build up, your ground connection provides a safe path for discharge directly to the earth rather than through your wiring. Reduces electrical hum and radio caused by inverters, motors, fluorescent lights and other devices, and not least. Minimal grounding is provided by a copper-plated ground rod, usually 8 ft. long, driven into the earth. 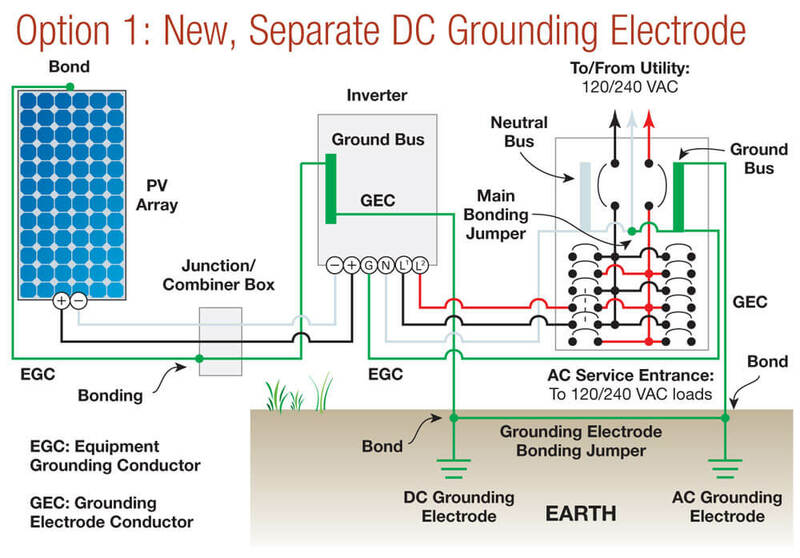 This is a minimum procedure in an area where the ground is moist (electrically conductive). Where the ground may be dry, especially sandy, or where lightning may be particularly severe, more rods should be installed, at least 10 feet apart. Connect or “bond” all ground rods together via bare copper wire (#6 or larger, see the NEC) and bury the wire. Use only approved clamps to connect wire to rods. If your photovoltaic array is some distance from the house, drive ground rod(s) near it, and bury bare wire in the trench with the power lines. Metal water pipes that are buried in the ground are also good to ground to. Purchase connectors approved for the purpose, and connect ONLY to cold water pipes, NEVER to hot water or gas pipes. Beware of plastic fittings — bypass them with copper wire. Iron well casings are super ground rods. Drill and tap a hole in the casing to get a good bolted connection. If you connect to more than one grounded object (the more the better) it is essential to electrically bond (wire) them to each other. Connections made in or near the ground are prone to corrosion, so use proper bronze or copper connectors. Your ground system is only as good as its weakest electrical connections. 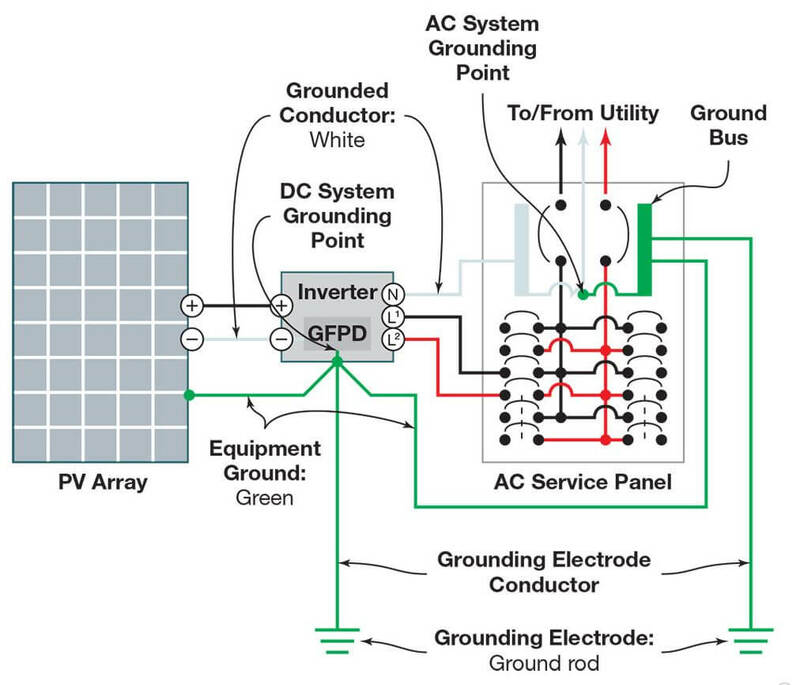 GROUND THE METALLIC FRAMEWORK of your PV array. (If your framework is wood, metallically bond the module frames together, and wire to ground.) Be sure to bolt your ground wires solidly to the metal so it will not come loose, and inspect it periodically. Also, ground antenna masts and wind generator towers. PV ARRAY WIRING should be done with minimum lengths of wire, tucked into the metal framework, then run through a metal conduit. Positive and negative wires should be run together wherever possible, rather than being some distance apart. This will minimize induction of lightning surges. Bury long outdoor wire runs instead of running them overhead. Place them in grounded metal conduit if you feel you need maximum protection. SURGE PROTECTION DEVICES bypass the high voltages induced by lightning. They are recommended for additional protection in lightning-prone areas or where good grounding is not feasible (such as on a dry rocky mountain top), especially if long lines are being run to an array, pump, antenna, or between buildings. Surge protectors must be special for low voltage systems.